Aquarelle.co.uk is a part of the Aquarelle group, founded in Paris in 1987 when Aquarelle opened its first shop on the rue du Commerce, in the 15th arrondissement of Paris. 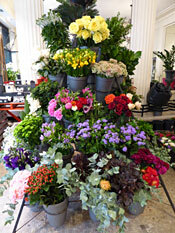 Within a few years, Aquarelle had built a network of flower shops in Paris and the provinces and had already become a reference amongst florists. Bouquets to keep or to give, in simple bunches or harmonious combinations, country-style bouquets combining flowers with fruit or woodland berries, delicate, fragrant compositions - our ideas and expertise quickly made Aquarelle's shops the success they are today. 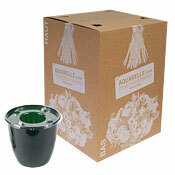 In 1997, Aquarelle opened its web site, delivering flowers all over France. Our high quality bouquets and reliable delivery times ensured the success of this service, which is now a European market leader. Today, with years of experience on the Internet, Aquarelle's UK web site www.aquarelle.co.uk offers the same exceptional service, as much for the impeccable quality of our flowers and the originality of our bouquets, as the speed and reliability of our deliveries and the range of services provided. Combining floral craftsmanship with the latest Internet technology, Aquarelle is delighted to share its passion for flowers with you through a highly original collection of bouquets. 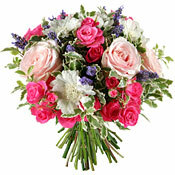 In our online catalogue, you will find a large choice of bouquets. You can also choose from a range of prices and we will adapt the bouquet's size and composition accordingly. Unlike other flower transmission networks, Aquarelle controls the entire process and composes exactly the bouquet you have chosen to offer. For every order you place, you will receive an e-mail with a link to a photo of the bouquet composed especially for you, taken just before it was dispatched. Romantic, perfumed or exotic... our collection of bouquets changes with the seasons, the events which mark the year and our florists' inspirations. Our florists compose and hand-tie all your bouquets. With fresh arrivals of flowers every day, our florists take the greatest care when creating your bouquets to ensure that you enjoy them for as long as possible. Our bouquets travel in a specially developed spill-proof vase of water guaranteed to keep your flowers fresh. Our fast delivery service ensures that your bouquet will reach its destination in perfect condition. All our products are delivered throughout Great Britain. Delivery cost £6.50 per bouquet or plant.